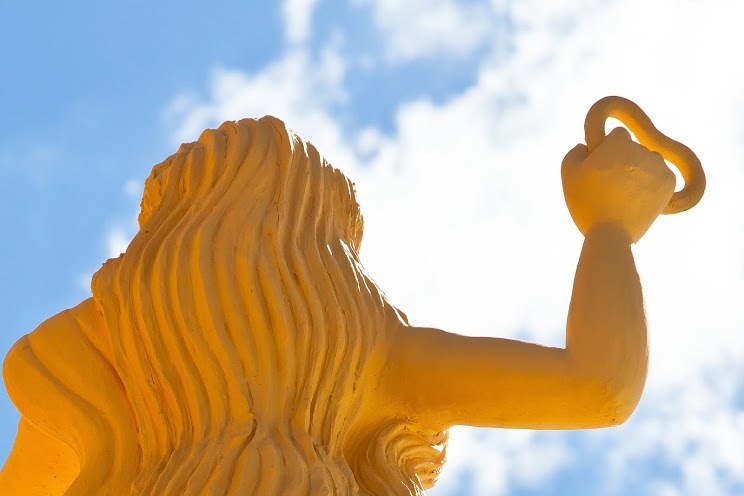 Sharni Jayawardena and Malathi de Alwis are fascinated by this goddess and have spent years observing and recording the ways in which she is honoured across Sri Lanka. Sharni is a documentary photographer, whose gift for empathy translates into a diverse, insightful body of work that engages with marginalised communities and records sweeping changes in contemporary Sri Lanka. For Malathi, this is her first professional foray into religion. As an anthropologist her research was always dedicated to political movements. The closest she has come to documenting faith before was during her PhD thesis, when her work with the Mother’s Front movement took her in to temples where women gathered to cry for justice to be wreaked on the perpetrators of disappearances. Worshiping the goddess. Pic by Sharni Jayawardena. In late February, with support from the Prince Claus Fund for Culture and Development, Sharni and Malathi staged an exhibition in Colombo and simultaneously launched an ambitious trilingual website (www.invokingthegoddess.lk). In the coming months the exhibition will tour Batticaloa and Jaffna with events planned in New Delhi and New York as well. While Pattini-Kannaki has been the focus of scholarly interest before, the duo are among the first to explore how faith in the goddess has manifested in Sri Lanka both during and after the conflict. There has been a resurgence in the numbers of her devotees and one needn’t look much further than the goddess’s conflicted, complicated past to understand why. Dating back to around the 5th century CE, the Tamil epic Silappatikaram or Tale of the Anklet is often considered the nearest thing India has to a great epic in a language other than Sanskrit. Its heroine is Kannaki and we discover that she has spent most of her life as a married woman in solitude, abandoned by Kovalan, her adulterous husband. When he does eventually return to his spouse, Kovalan is impoverished and disillusioned with his mistress. Kannaki proves herself a faithful wife when she welcomes the prodigal back. The couple decide they will sell her gold anklets and begin a new life together. Their happy ending is thwarted when Kovalan is wrongfully accused of stealing the queen’s anklet and abruptly executed by royal decree. What happens next may explain why, though Kannaki is revered for her chastity, even her devotees seldom name their daughters for her. In her rage, she tears out her left breast and flings it at Madurai, calling down fire and destruction that will level the city and leave it a smouldering heap. In his translation ‘Silappatikkaram, The Tale of an Anklet,’ R. Parthasarathy sets down the moral of the story: ‘We shall compose a poem, with songs/To explain these truths: even as kings, if they break/The law, have their necks wrung by dharma.’ In his introduction, the translator again underlines the point: “Kannaki represents the ancient Tamil belief in a divine mechanism of retributive justice to those whom human law fails to protect.” In this aspect, Kannaki is chilling; the ally of the desperate, the despairing and those with nothing left to lose. Elsewhere on the island, Sinhala Buddhists welcome her into their home as Pattini, for most part unaware that she is deity they share with the Tamil Hindu community. To them she is a fellow traveller on the path to enlightenment – and Buddhahood – and someone they can identify with. She is also the only female deity to claim a place of honour in the Theravada pantheon. 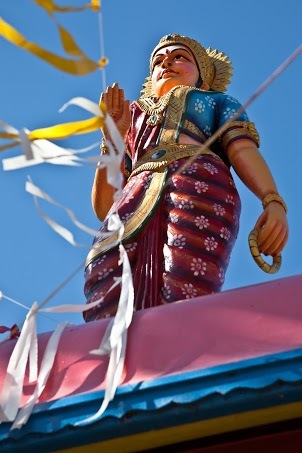 Hailed as one of the four guardian deities of Sri Lanka, Pattini is the focus of night long rituals and revelries in the gammaduwa or village hall. Colourful altars pay tribute: wreathed in incense, these bear offerings of fruit and flowers and are exquisitely bedecked in woven coconut fronds. Rituals are staged to banish diseases and retain the prosperity and fertility of village fields. As the night deepens, there is less and less room for prudes. Ribaldry abounds: the dancers come out to keep company with the acrobats and the fire eaters (watch them nonchalantly lick their flaming torches) before the arrival of the kapu mahattaya, typically a prominent man in the community now ‘incarnated’ as goddess Pattini. Dressed in sari, his arrival triggers the possession of devotees by the goddess. In towns such as Ambepussa, just 45km northeast of Colombo, scenes from the Pantis Kolmura are also re-enacted – always by a cross-dressing, all-male cast. This chauvinistic exclusion of women extends far beyond the stage. Sharni and Malathi were barred from witnessing many key events in the ritual cycle including the horn pulling or an keliya (in Sinhala) ceremony. Even the handful of priestesses that do exist seldom have authority in shrines outside the ones they maintain in their own homes. “What does it mean for women today, in a post-feminist age, to find everything is controlled by male priests?” asks Malathi. Access wasn’t their only challenge. The sheer diversity of narratives and rituals is dizzying. “Everyone has taken off from the ‘Silappadikaram’,” says Malathi, pointing to localised versions that incorporate caste distinctions or insert tales of sea battles into the story. Still, by chronicling these often moving expressions of religious faith and local culture, the two women hope to give the two communities a glimpse of their shared heritage. “We wanted a space where both groups would read it and realise all they had in common,” they say. In the end, it’s clear this ancient mother goddess still holds sway over modern Sri Lanka – but could their shared belief be enough to unite her devotees? Published in The Hindu on 6 April, 2014. Words by Smriti Daniel. Pix courtesy Sharni Jayawardena.